Q. 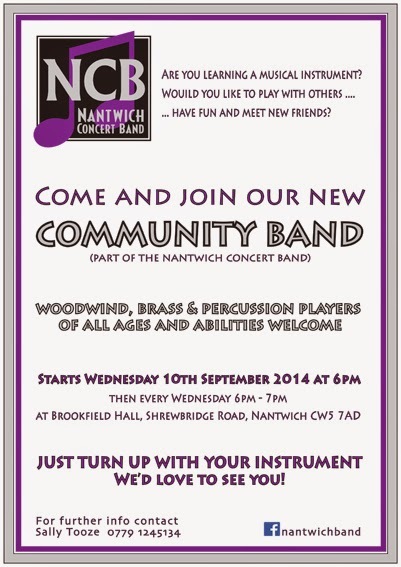 When did you join Nantwich Concert Band? Q. What instrument do you play in the Band? A. Flute. I've had lessons for 2 years and take my Grade 3 in June. Q. What other bands are/have you been involved with? A. None. This is my first and I love it! Q. How did you start playing music? A. I learnt to read music at primary school and played recorder there. At secondary school my best friend started having flute lessons and I was fascinated - all those shiny keys! Sadly my parents could not afford the lessons. Q. Do you play any other instruments? A. Recorder, which I played until age 14, having reached Grade3 when I gave up - it was so uncool! Q. Favourite Training Band piece? Q. What music do you enjoy listening to? Q. What are your other interests? Q. Is there anything unusual about you we might not know? A. About 3 years ago I was asked by my son's Primary School to help with their Christmas performance, accompanying a group of recorder players. I got chatting to one of the teachers who had recently taken up the flute. When I got home, I told my husband how it had been a childhood dream to play the flute. On Christmas morning he handed me a gift - it was a flute - best present EVER! Q. 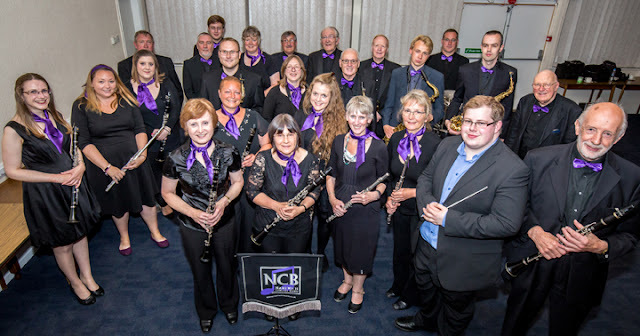 What is the best thing about playing in the Nantwich Concert Band? A. Meeting lovely new people and playing together! Q. What is your main instrument? Q. What position do you play in the Band? A. Descant, treble and bass recorder, oboe, clarinet and alto sax. A. I learned recorder at primary school. When I started at secondary school I saw a picture of a bassoon on the wall and decided that that was what I wanted to play. 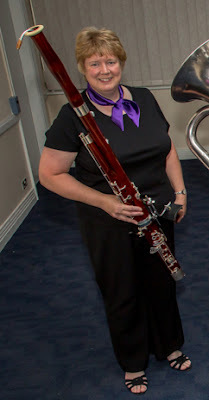 The music teacher allowed me to borrow an oboe until they could source a bassoon for me to learn on. Q. What are your musical goals? A. To have fun, enjoy making music and continue learning. May be play a solo?!! A. I bikejor with my terrier, Treacle. This involves fastening my dog to the front of my bike on a special line and encouraging her to pull. I try and keep up. We can do 16 mph for short distances - although the jury is out as to who gets tired first! And we race with other like minded idiots! Sadly we are unlikely to win as they seem to fasten huskies, collies, pointers and other large dogs to the front of their bikes, but we have a great time! A. The people in it and the exciting way the band is moving forward and learning new music with Nick. A. My auntie bought me a recorder and a book about how to play it. I learned music at an Early Learning Centre when I was very young and taught myself to play from the book. Neither of my parents play. A. To pass my Grade 5 theory and Grade 6 Clarinet and get better on my flute. A. Not really, I'm too talkative to keep much back! A. The people I have met - true friends. A. I learnt to read music at primary school and played recorder there. At secondary school I was given a cello to play but we never really hit it off - I am by nature a top line player! 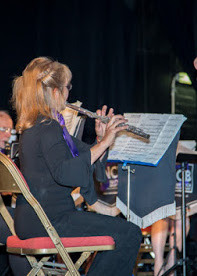 For a few years in my 30s I played the clarinet but finally, I took up the flute when I was 52 - and I've never looked back - I LOVE it - wish I'd done it in the first place! A. I recently bought a piccolo, which I play in the Training Band. A. Difficult question as we have a lot of new fun pieces in the Band repertoire but a lot of my favourite pieces like Les Mis and Phantom of the Opera all unsurprisingly seem to include flute solos. The flutes so often get the best tunes! I also enjoy playing traditional marches like New Colonial and King Cotton. A. All sorts. Classical, I like Baroque best. Contemporary, I'm a huge Leonard Cohen fan. I also like jazzy rock and blues. A. My day job is as a Batik artist, so I'm always creating. I love my family and my garden. I am also for my sins, Band Librarian and Website Editor. A. Daughter of a bishop, I come from a musical family. My 1st cousin, on my mother's side, was MD of the Royal marines Band (plays euphonium & cello) and conducted at the Queen's 90th birthday celebrations. My cousin, on my father's side, is 1st clarinet in the New Zealand Symphony Orchestra. My brother is a violin maker and plays one of his own violas in the Leeds Baroque Orchestra. I have otosclerosis and am completely deaf in one ear and wear a hearing aid in the other - but luckily it hasn't affected my pitch or enjoyment of music. A. You can't beat the buzz you get when you are all playing together and it is sounding good and I've made some great friends! A. Around 1990 - in fact, I think I am the longest serving current member of the Band, which is quite a sobering thought. A. I taught myself the flute watching Jungle Book, after having recorder lessons at school! A. Not to make too many mistakes! A. Crewe Alexandra Football Club and eating out. A. I played for Nantwich Band on the morning of my wedding - there's dedication for you! A. Playing alongside my dad Arthur (2nd clarinet), also, hearing a piece of music go from 'unplayable' right through to 'concert standard'. A. At college I started teaching myself classical guitar and continued after leaving college. I lost interest in brass playing during my first year of teaching despite being in West Yorkshire, the heart of brass banding! I never did any exams in brass playing but achieved a distinction at Grade 6 in classical guitar. Oh, and I also play the treble recorder which is a beautiful sounding instrument. My wife prefers this to my trumpet! A. Aged 18, I learned to play the euphonium with ICI Alkali Brass Band, Winnington. 1963-66 2nd Euphonium with York Railway Institute Brass Band. 1973?-80? 2nd then later Solo Euphonium with Crewe Co-op Brass Band. 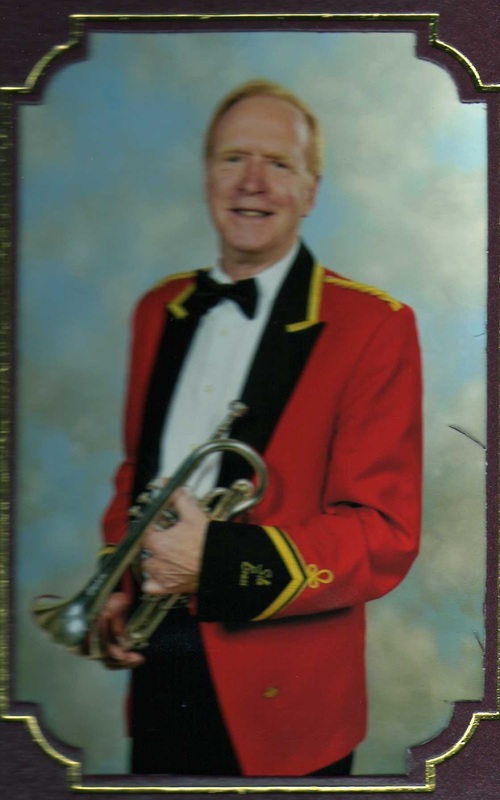 1997-98 3rd Trumpet with The Skyliners Swing (no, not ‘swingers’!) Band, Bahrain. I have ‘depped’ with various bands and orchestras eg. Macclesfield Light Orchestra, Kems Orchestra & Band. I recently played in the pit orchestra for the show Mame in Stoke. A. My biggest regret is, as a child, not continuing with piano lessons. At the time I preferred to be out playing with my mates. But later in life I would often tell my mum that I wish she had made me stick at it. I learned to play descant recorder in the lunchtime at grammar school. I took GCE ‘O’ Level Music which was purely theory (you didn’t have to play an instrument) but it gave me a useful grounding for later musical activities. A. In the current NCB repertoire I like playing the marches especially On The Quarter Deck and Colonel Bogey. A. I have fairly eclectic musical tastes including blues, soul, funk etc. but I will always return to the Baroque, Classical and Romantic periods. Composers I like include Bach, Vivaldi, Mozart, Beethoven, Brahms, Sibelius, Mahler, Bruckner and Richard Strauss. My favourite work would be Bach’s Orchestral Suite No.2 in B minor. A. I’m a bird watcher and a volunteer with the RSPB. I enjoy walking, usually in The Peak District. I love going to live music events in Manchester at The Bridgewater Hall, the RNCM & Matt & Phreds where I joined in a Soul Jam night on trumpet. A. Oh dear! OK, I fell off the stage while playing Solo Euph with Crewe Co-op! Some people remember me for that rather than for my playing! A. Playing alongside woodwind instruments which obviously you don’t experience in a brass band. PS Over the years there have been lots of gaps in my brass playing in favour of the guitar. But it was Wyn Barnet who got me playing again. When, in 1998, I returned to England after living and working in the Middle East, my trumpet, which I’d only recently bought in Hong Kong, was consigned to the loft. In 2007 he encouraged me to get it down and to join the West End Band as it was known then. It was a great thing you did, Wyn. Others may disagree after hearing me play! !